Hi friends! I hope you are having a lovely week! I am doing alright over here. Hopefully, I'll be fully recovered soon. Other than that, there's not too much going on around here. I can't believe it's almost March! This year is flying by so far! I used My Thoughts Exactly The Birds and The Bees set. The paper is from Kaisercraft, brand new Tiny Woods. I also used a label punch and cut it in half for the sentiment. 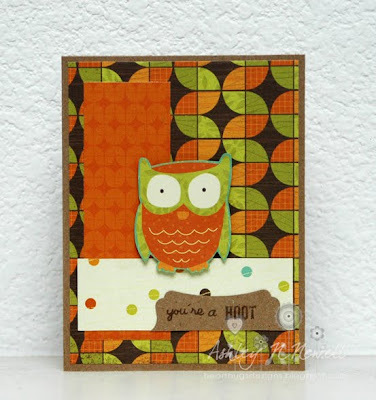 My next card uses My Thoughts Exactly Lovey Puns Animals and again the Kaisercraft paper. The button is actually vintage and I just used a little string. 2 adorable cards-love the puns :) Thanks for getting punny with us at CAS-ual Fridays! Your DP's are amazing. Love the bright colors. These cards are so stinkin' cute. Thank you so much for playing along at CAS-ual Fridays.